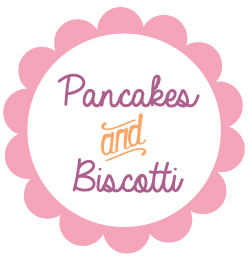 For the first time in the four + years in which I've been blogging, Pancakes & Biscotti is experiencing a bit of a lull. Working on this blog -- usually one of my favorite activities! -- has become an effort lately. My brain and time have been overly occupied the past 2ish months, leaving my energy and creativity levels low as a result. My workload in my new team has been intense (lots of big meetings as part of the 24th Committee on Forestry, complete with a whole meeting on poplars, which I personally find endearing, but also demanding, damn those adorable poplars) not to mention some tumult in a few areas of my personal life, plus some traveling. All of this has kept writing and cooking low on the priority list, and I've seemingly lost sight of the blog-centric mentality I'd always possessed up until recently. Uff. Coffee semifreddo? Hazelnut semifreddo? Coffee/hazelnut semifreddo? Something with corn -- fritters? Too hot for frying? Cucina Conversations -- pomodori gratinati?! Cherries -- clafoutis? Tart? 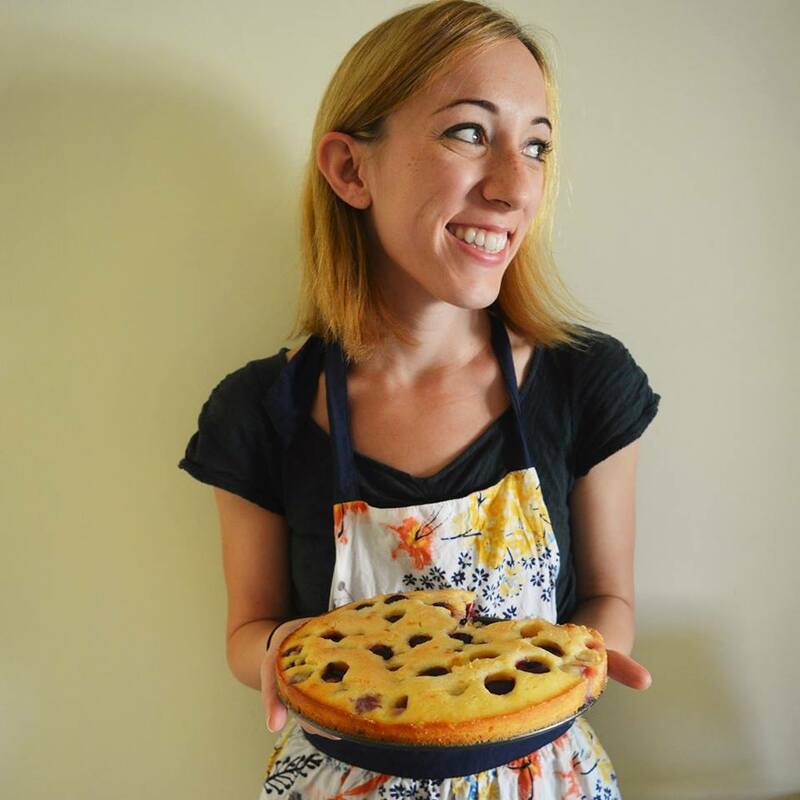 Pie recipe from Federica? And just like that, or at least for this weekend, I'm feeling more like myself again, back in the game, with angles for posts accompanying the many recipes that suddenly came to me, or rather, that just needed a little bit of space to make it on to my piece of paper. But let's focus on that second recipe on my brainstorming list -- pesto (much like gelato, anything with tomatoes, and more garden-grown zucchini than you can handle) is a food that is synonymous with summer. It's no-cook, perfect for when the temperatures are high and turning on the oven of stove seems impossible, and (traditionally) makes excellent use of the emerald green bunches of basil that are so abundant this time of year. Today's pesto is a riff on the classic basil, pine nut, and Parmesan pesto, one where we keep the summer-y basil, but swap the pine nuts for almonds and exclude the Parmesan all together, leaving it to the citrus to pack the flavor punch; interestingly enough, a little hot water is whisked into the pesto to give it a smoother, richer consistency. 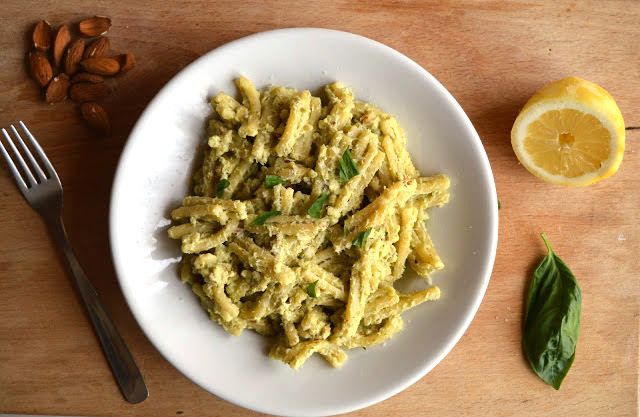 The result is an intensely sunshine-y, lemon-y pesto balanced by a bunch of floral basil and mild, nutty almonds -- peeled and unpeeled, to shake up the texture and flavor -- which perfectly, dreamily, coats every piece of pasta. Like most pasta dishes, this one is excellent with some freshly grated Parmesan over the top; that being said, if you leave out the cheese this pasta can be completely vegan, a category in to which very few recipes on this blog fall, but are useful when you have a newly-vegan bff (this is for you, Gabriele). In any case, getting back in the kitchen this past weekend proved to be calming, fulfilling, just what I needed, and not even the smoke that began to seep out of my trusty mini food processor, RIP, could mess with that (no food processor, no problem -- I chopped the almonds by hand!) No matter where you find yourself lately -- whether you're preoccupied like me, or feeling pretty zen -- this pasta is guaranteed to do you some good, in the way that only a delicious bowl of carbohydrates can. Yum. 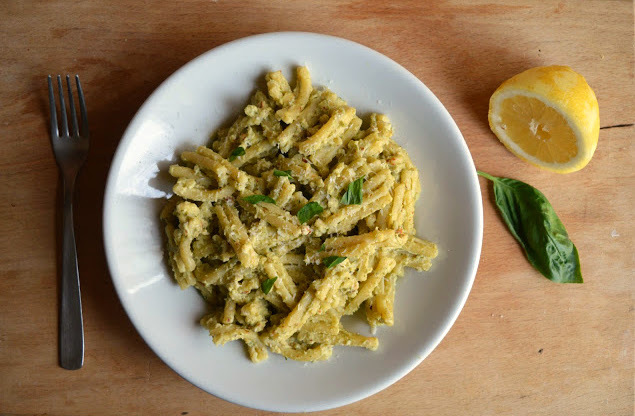 A couple of notes: I used a very large lemon from the Amalfi coast in this recipe and the lemony flavor was spot on for me; if the lemons you have are smaller I suggest you use two of them for the zest, but taste the pesto as you go and see what your taste buds tell you. If you don't have a food processor feel free to use a knife to cut up the almonds until they're very fine -- it requires a bit of elbow grease but it works well. If you have a traditional mortar and pestle, you can also use that. Note that the pesto here will seem a bit thick at first, but that's because you'll be adding in lemon juice, hot water, and then probably a little pasta water at the end, so don't fret. Finally, feel free to use any cut of pasta you want here. Looking for other pesto recipes? 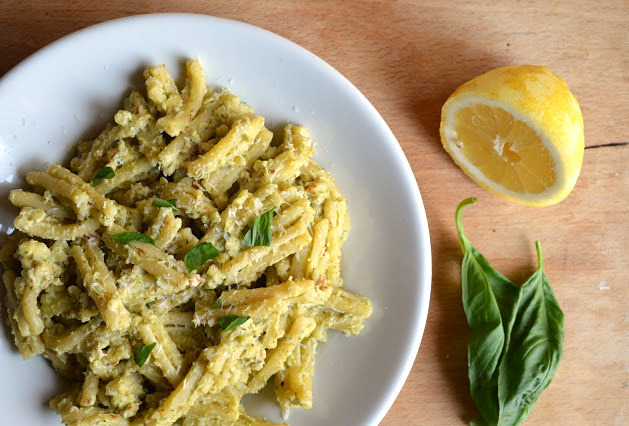 I've got this Basil Pesto, this Sun-dried Tomato Pesto, and this Pistachio Parsley Pesto. Looking for other summer-y pasta recipes? I've got this Spaghetti with Basil and Cherry Tomatoes, this Pasta with Swordfish and Eggplant, this Pasta with Eggplant, Tomatoes, and Mozzarella, and this Spaghetti with Zucchine. Recipe adapted from Giallo Zafferano. Put a pot of water on to boil for your pasta, and then start on the pesto. 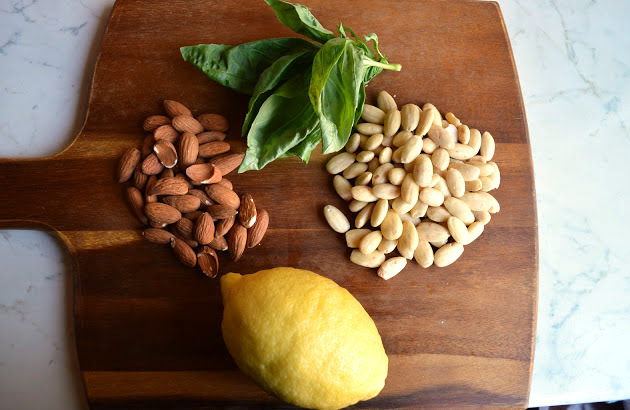 In a food processor, blitz the almonds (peeled and unpeeled) a few times until finely chopped. Add the basil and olive oil and blitz a few more times, then add the lemon zest. lemon juice and a bit of salt and pepper and process until smooth. The pesto will seem to be on the thicker side -- don't worry about this. Place the pesto in a large bowl. When the water has come to a boil, salt the water, and add the pasta, being sure to take note of the package directions for the cooking time. In the meantime, add a few tablespoons of hot water to the pesto and whisk until it thins out a bit. When the pasta is done, reserve a ladle-ful of the pasta water and taste again for seasoning. Set aside. Drain the pasta and add it to the bowl with the pesto and toss together, adding a little bit of the pasta water until the pesto coats the pasta nicely. Eat immediately with some freshly grated Parmesan on top, if you want. Serves 2 with left overs.